My second installment of Best Books Ever! in Lisa Pijuan-Nomura’s The Red Letter is out! Confession: I love swimming. I love it so much (except for the goggle marks I have around my eyes for hours afterwards) that I swim sometimes five or six times a week. In fact, I love swimming so much I’ve made my newest character a lifeguard. 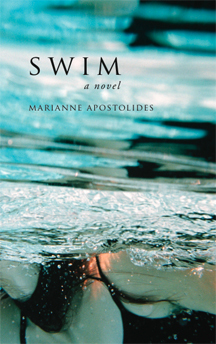 So it wasn’t a huge stretch for me to pick up Swim by Marianne Apostolides. And this slip of a book, clocking in at a mere 93 pages, fulfills its name, taking the reader into the meditative, circling state inherent in swimming laps.